Explain the benefits of Service Cloud features in Lightning Experience. Start customizing the Lightning Service Console for your users. Wondering which Service Cloud features are available in Lightning Experience? Well, wonder no longer! Let’s talk Service Cloud. 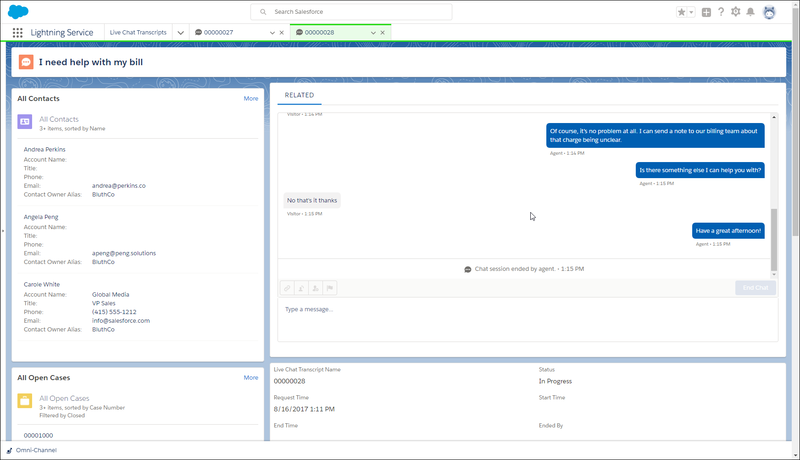 The Lightning Service Console is a standard Salesforce Lightning console app that’s designed to meet all your service team’s needs. Plus you can customize the console to make it your own. Here’s what you get in the standard Service Console app. Here’s how the standard Service Console app helps you out. 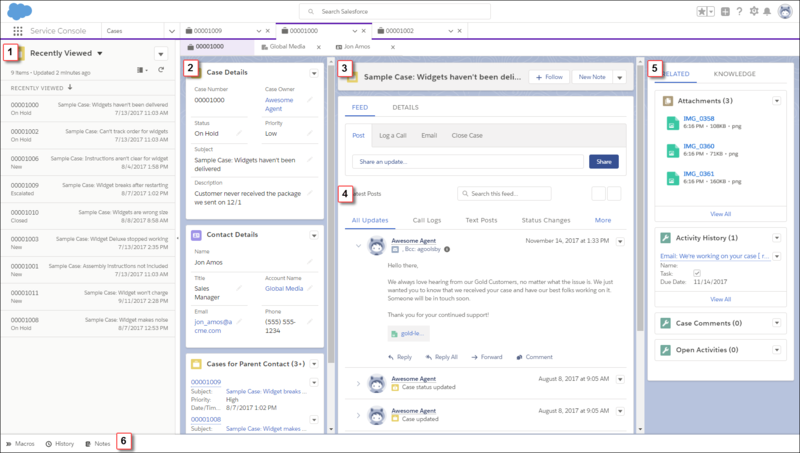 Split view shows a list view at the same time as workspace tabs and subtabs, letting your support agents manage multiple cases on a single screen (1). A preconfigured, three-column layout puts all the important information on the same page, and minimizes clicks and scrolling. In the first column, case details, contact details, and related cases for the parent account are displayed using Related Record and Related List Single components (2). The second column includes a highlights panel that’s front and center (3). The compact case feed lets you see more of your case updates (4). The third column includes related lists and Knowledge articles relevant to your case (5). The preconfigured utility bar provides fast access to History and Notes (6). You can also customize the utility bar to include other tools like Macros, Omni-Channel, and the Open CTI Softphone. For users to see and use the Notes utility, Notes must be enabled in your org. For users to see and use articles in the Knowledge component, Lightning Knowledge must be enabled in your org. As awesome as the default Lightning Service Console is, with a little polish, you can tailor it to meet your specific service needs. The Service Console app is automatically assigned to all standard and custom user profiles. You can modify these assignments to make sure that only the right people have access to the app. The only thing you can’t change is the app’s Developer Name. So what’s so great about Lightning Knowledge? Everything you need is all in one place! It provides a high-powered yet streamlined way to manage your knowledge base. You get the benefits of standard objects that work just like other objects in Salesforce. 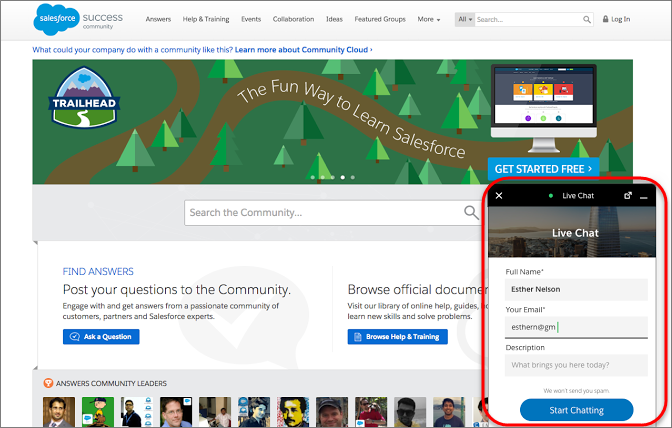 Lightning Knowledge has changed the way Knowledge works in Salesforce. Standard record types replace article types, and the Knowledge component for Lightning Service Console replaces Knowledge One for the Service Console in Salesforce Classic. These changes make it much easier for you to set things up. Your support agents can search, view, author, and manage articles from a single Knowledge home page in Lightning Experience. Plus, they can do the following authoring actions without leaving Knowledge home. Snap-ins chat allows customers to get quick answers to their questions by chatting with an agent while browsing your site. So, it’s a great idea to add the Snap-ins chat widget to your website! Snap-ins chat uses Live Agent, but in Lightning Experience you have a simpler setup on the Service Console. What the customer sees: the chat widget button sits on your web page, and when someone has a question, they simply click the button to launch the chat. Customers fill out the brief pre-chat form, which helps agents gather basic information about the customer, like their contact information and their needs. Customers can chat while viewing your web page, and they can minimize the chat window whenever it’s in their way. The chat widget persists across your web pages so customers can keep browsing while chatting with an agent. This example shows what support agents see when they chat with customers via Snap-ins Chat. Snap-ins Chat sits directly in the Service Console, allowing a quick and easy response to customers. Help your support team use data to uncover key insights and drive the success of your service business. 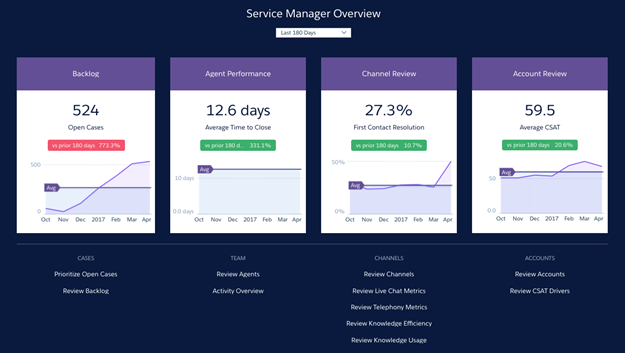 The Service Analytics app shares best-practice key performance indicators (KPIs) about your service data in a single place. Even better, the app tailors this information by role, so everyone on the team gets the right information at the right time. Using the prebuilt dashboards in the Service Analytics app, service managers can quickly view average case closing times, customer satisfaction, and trending, historical, and peer benchmarks. They can also get insight into the team’s use of knowledge articles to resolve cases, and other data so they can quickly take appropriate actions. Another set of dashboards—called sidebars—are specifically for support agents. For a given case, an agent can view customer history, number of cases, and CSAT. Ensure that agents have fast access to this information by embedding these sidebars on key Salesforce pages, such as the service console. Sounds complicated and time-consuming to set up? Most of the hard work is already done for you! We built the complex queries, formulas, and ratios that draw from your service and sales data, and assembled them into easy-to-read visualizations. All you do is run a built-in configurator and answer a few questions about the data and fields you’d like to see. Woohoo! Field Service Lightning is a mobile-friendly field service hub for your service team. Your agents can easily connect with people who work at customer sites, or who work on the go in delivery vehicles. Field Service Lightning helps everyone on the team make smarter decisions with visibility into operational performance and key performance indicators. Create service resource records that represent your field service technicians and add details about their skills, service territories, and availability. Set up multilevel service territories that represent the regions where your technicians work. Track your product inventory and service vehicle locations. Schedule one-time or recurring appointments for customers and add details about technician preference and required skills. Standardize your business’s field service tasks with maintenance plans and templates. Keep customers informed about service progress with on-site service reports. Omni-Channel helps your service center route any type of incoming work item—including cases, chats, or leads—to your most qualified, available agents. It’s flexible and customizable, and you can configure it without writing code. Pretty rad! Use Omni-Channel to manage the priority of work items for agents and balance the distribution of assignments. You can also define which agents work on different types of assignments, such as leads or sales inquiries, and other assignments that help with support questions. Omni-Channel routes all these assignments to the correct agents automatically, which your agents will love. They no longer have to pick and choose work assignments from a queue, which saves everyone time, effort, and brainpower. 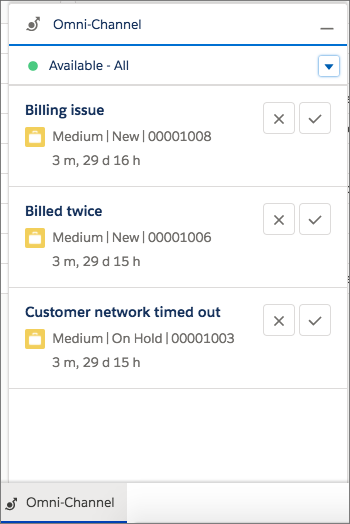 In Lightning Experience, the Omni-Channel utility delivers work right to your Lightning Service Console users via requests routed through Omni-Channel. Console users can set their presence status and accept or decline work depending on your Omni-Channel settings. Help your support team deliver personalized customer service from one of your most important channels—social media. 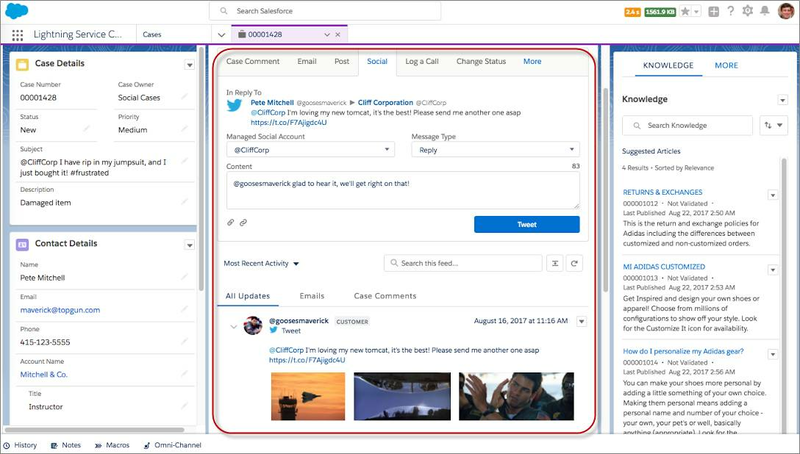 Social Customer Service integrates with Twitter, Facebook, Instagram, and YouTube to deliver customer conversations directly to your agents. Setup is easier than ever in Lightning Experience, including Social Business Rules to quickly define how social cases are handled. Support agents get the tools to manage cases originating from social media and engage customers by responding directly in social networks. Inbound and outbound social posts appear as items in the case feed, making it easy to follow conversations. Attachments to posts are also viewable right in the feed. Agents can respond to posts using the Social action in the publisher and include an attachment or a Direct Message prompt. They can also like conversations, reply privately to customers, hide comments on Facebook, and delete conversations managed by your company’s social accounts.